Two squares have been removed from this 8×7 rectangle. 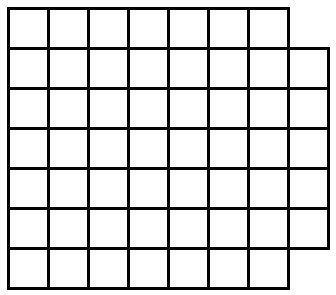 Can the remaining 54 squares be tiled orthogonally with 18 3×1 tiles? Check in for the answer tomorrow! I’m going to say no, but I don’t have a proof. Not that, however you put a 3×1 tile, it will cover exactly one “1”, one “2”, and one “3”, which means that a necessary condition to be able to do such tiling is to have exactly the same number of all of the three. Also, we have 19 “1”s, 19 “2”s, and 18 “3”s. But, when we remove the two tiles, we remove two “2”s, so we end up with uneven number of these tiles, so the tiling is not possible. Had we removed two opposite corners, the tiling would be, quite obviously, possible. Charon beat me to it, but yes. This is a classic introductory combinatorics problem. I hadn’t done it with 3×1’s yet, but the proof is the same as in the 2×1 case. What gets more exciting is as you go away from dominos, trinimos, etc., to more interesting tetris-like pieces.